At the beginning of the year, you may recall that we introduced our new gold Chiavari chairs. As a company, we have traditionally offered the classic Chiavari chair colours of limewash, silver, white and black, but we also recognised a growing demand in the market for gold Chiavari chairs, and what a decision that was. Since our gold Chiavari chairs arrived, they have been in constant demand for weddings, corporate hospitality events, banquets, society balls and other similar celebratory occasions. Pictured here are 450 gold chiavari chairs being set up for a wedding at a venue in the West Midlands last weekend, complete with ivory seat pads and accessorised with a single inner row of burgundy organza chair ties which look fantastic to match the decor. The colour gold is synonymous with quality, style, sophistication and luxury, and so perfectly matched for weddings and parties. If you need to hire gold Chiavari chairs and, indeed, any other colour of Chiavari chair, then get in touch with the experts here at Event Hire UK. 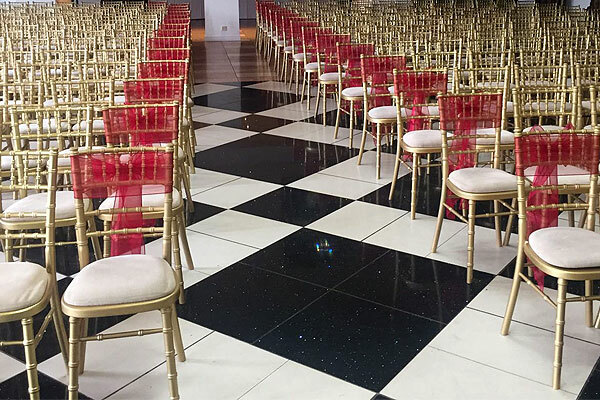 Chiavari chair hire is one of our many specialities, working tirelessly behind the scenes with wedding planners, wedding venues and event organisers to provide a seamless, hassle-free chair hire experience. You can rest assured that your Chiavari chair hire is in safe hands, enabling you to concentrate on other areas of your event to make it the complete success you want it to be. You can find gold Chiavari chair in our complete Chiavari chair hire range which lies in our wider chair hire range and our subsequent furniture hire range. Contact us today to hire the chairs you need for your upcoming event.